TAUNTON, Mass. 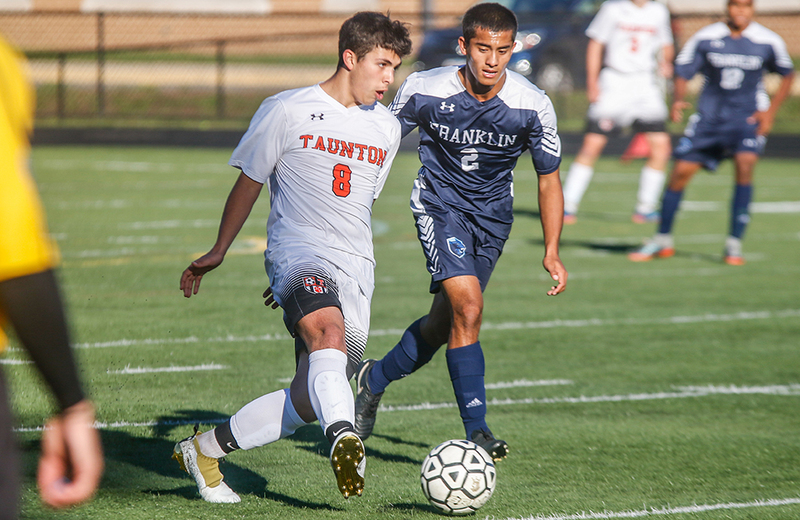 – Coming off its biggest win of the season in the D2 South Semifinals against top-ranked Nauset, Oliver Ames head coach John Barata was admittedly a little worried how his Tigers would come out on Tuesday night against Pembroke in the sectional final. But those worries were quickly erased as the Tigers came out firing, dictating the play throughout the first half. 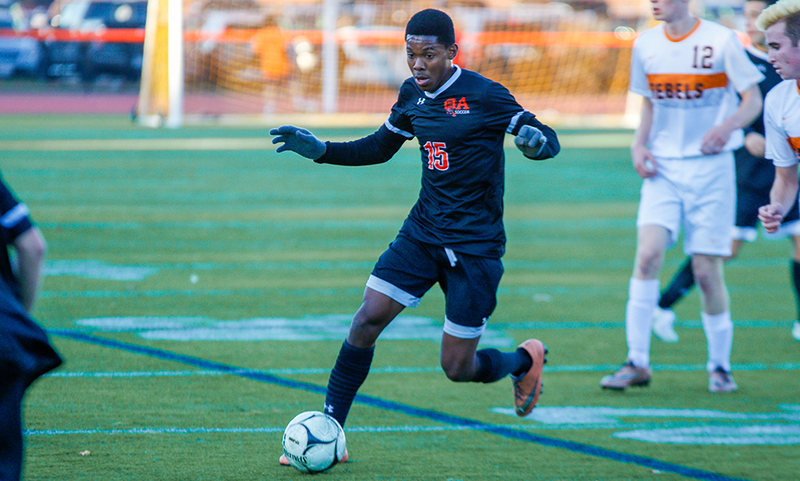 OA took the lead just before the halftime break and then added two more in the second half to earn a 3-0 win over the sixth-seededa Titans, giving the fourth-seeded Tigers their third D2 South crown in the last four years. It shouldn’t come as a huge surprise that the Tigers were ready to go. With 21 seniors on the roster, Oliver Ames is stacked full of playoff experience. In 2015, a handful of those seniors – then sophomores – played vital roles in five postseason wins including a win in the D2 State Final. And last year, they picked up experience in two more postseason games. Now in the program’s 16th playoff game since they were freshmen, these seniors had no trouble getting going from the start. Less than a minute in, the Tigers had two goal scoring chances. Senior Chris Lawrence’s throw somehow flew through the area without a recipient. And seconds later, senior Mason Galbato chipped a service in but senior James Gillespie’s header was saved. Three minutes later, senior Matt Alvarado found Gillespie at the far stick but his header just went over the bar. Two minutes later, Gillespie’s low shot just missed the far post after senior Michael Nikiciuk had set him up via a low centering pass. 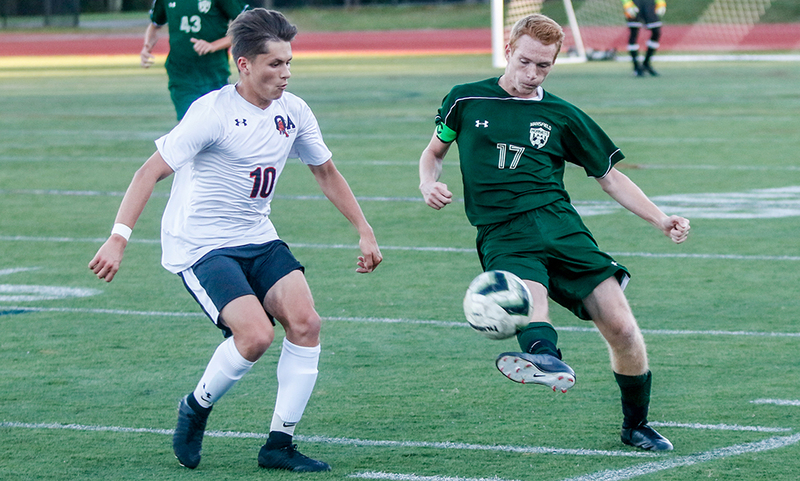 In the 18th minute, Lawrence launched another long throw that slipped through the keepers’ hands but Brian Flaherty cleared the loose ball off the line to prevent the Tigers from taking the lead. Flaherty gave the Titans their best chance of the first half. OA senior keeper Jack Carroll did well to clear away a cross, but the loose ball fell to Flaherty who floated a shot off the crossbar from 25 yards out. But the momentum didn’t shift as OA continued its pressure. Alvarado touched a ball over the top that Pembroke tried to shield back to the keeper but strong pressure from senior Nathaniel Cardoza nearly gave the Tigers the lead. A minute before half, the Tigers cashed in on a corner kick. 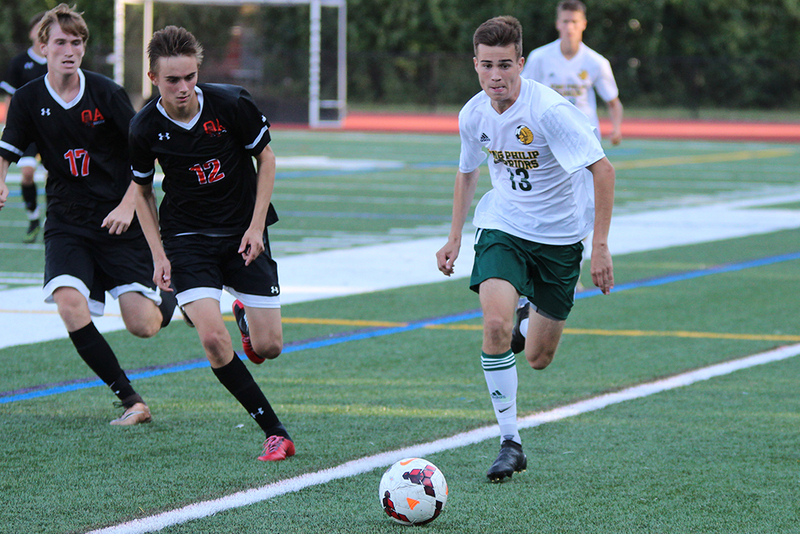 Senior Jack Sheldon drove the corner right to the six-yard line where Cardoza rose up and nodded his header inside the near post for a 1-0 lead. While Pembroke picked up some of the play to begin the second half, the Tigers withstood the pressure. The best chances for the Titans came on a scramble in front off a corner kick, but OA did well to clear it. The Tigers finally found an insurance goal in the 71st minute. Sheldon gained possession on the right flank near the corner flag. He was able to beat his defender along the line, drawing the defense out. He slid a pass right to the penalty spot where Alvarado calmly blasted a right footed shot into the back of the net to make it 2-0. OA put the game away for certain just two minutes later as Gillespie was rewarded for a great run with a service into the area. His shot was saved but Nikiciuk was right on the doorstep to tap it in for a 3-0 lead. 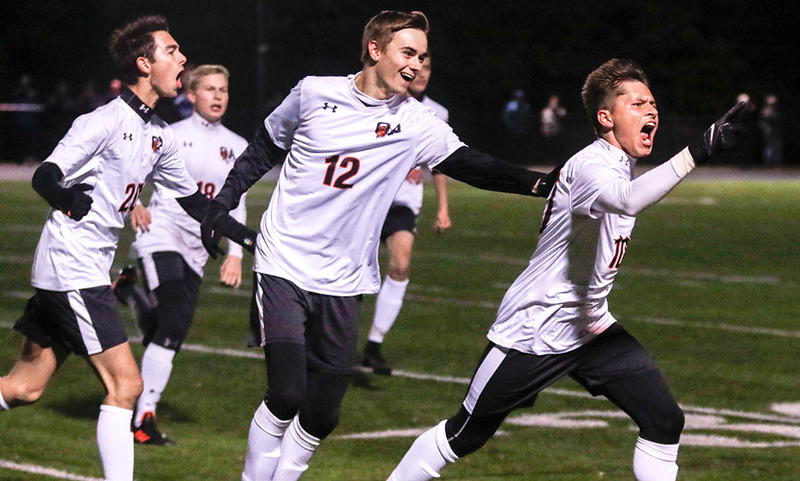 With the win, Oliver Ames boys soccer (15-2-4) advances to the D2 State Championship to take on North sectional champion Concord-Carlisle (13-2-6) on Saturday, with a location and time to be announced. It is also a rematch of the 2014 final, a 1-0 win by the Patriots. NORTH EASTON, Mass. – Oliver Ames senior James Gillespie didn’t have a ton of touches on the ball during Thursday’s nights game against Walpole, but he certainly had the two most important ones. 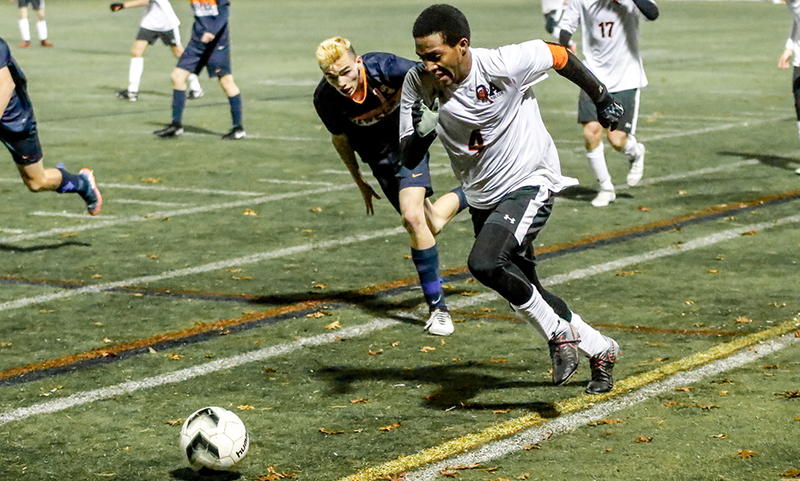 Gillespie scored a pair of goals, including the game-winner in double overtime in the 94th minute of play to help the fourth-seeded Tigers avoid an upset bid by the 12th-seeded Rebels. The Tigers nearly had the game won in regulation but Walpole struck with just over a minute to play. With just their second shot on goal of the half, Rebels senior Luccas Ferreira got just enough of a header on a long throw-in from Kevin Sullivan to tie the game. Oliver Ames had its chances in the first half but only converted once. In the eighth minute, senior Matt Alvarado combined with Gillespie, who laid a pass off to Michael Nikiciuk but his bid was at the keeper. A tactical change helped create the Tigers’ goal in the first half. Head coach John Barata switched senior Matt Campbell from the right side of the pitch to the left side. Shortly after, Campbell won possession on the wing and delivered a low cross that found its way through the area to the back post, where Gillespie tucked it in on a one-timer. The lone scare of the first half came via miscommunication between the defense and keeper. A defender attempted to head the ball back to Jack Carroll, who had come out to get it himself. Senior Colin Evin recovered nicely and cleared the ball just before the goal line to preserve the one-goal lead. OA kept the pressure up but couldn’t find the back of the net. In the 29th minute, Alvarado slipped a through ball to Nikiciuk, who got a slight touch before the keeper, but Walpole’s goalie recovered nicely. A minute later, senior Nathaniel Cardoza linked up with Alvarado, who cut it back to put the ball on his left foot but his shot was slightly deflected and just hit the post and stayed out. On the ensuing corner, Walpole partially cleared the ball but Mason Galbato took the ball down on his chest and fired a low shot that just rolled wide. 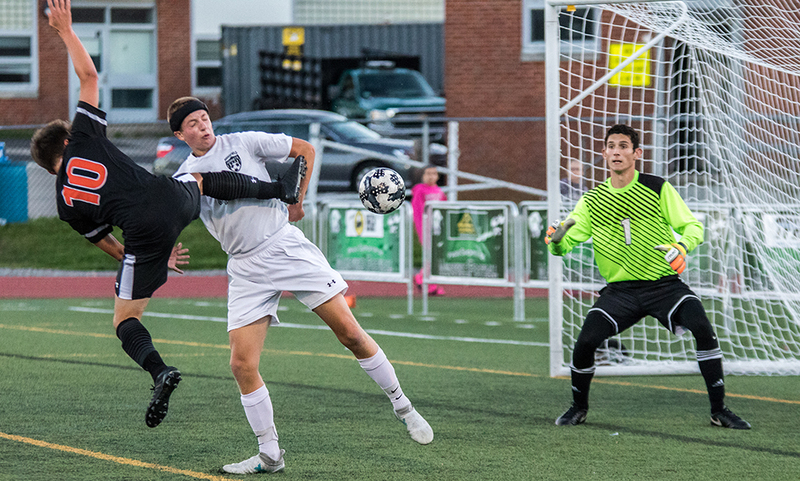 The chances continued in the second half when Jack Sheldon found Alvarado two minutes in, but his left-footed strike was knocked down and saved. Good pressure from Nikiciuk resulted in another chance in the 57th minute, as his hard run to a loose ball forced a collision between keeper and defender, but before the ball would sit for Alvarado on the rebound, a defender made a nice tackle to block the shot. Sheldon forced the keeper into another big save in the 67th minute. His shot from just outside the area was slightly deflected and popped up on the keeper on the bounce, but he got just enough to push it over the net. 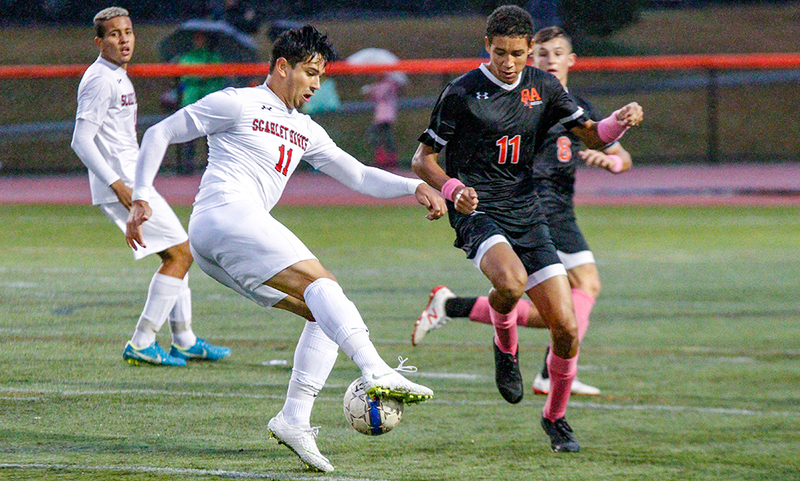 “We knew we needed two goals against them because they might sneak one in,” Barata said. “The funny thing is the game should have been over; should have been over in the first half, should have been over after the second half. We should have had three or four to be honest. [Walpole] is a very good team but we had multiple chances. I don’t think they had five shots. We have to learn from this that this could have easily been a loss in a game that we purely dominated. We knew it’d take two goals but I just wish it came earlier. Walpole had its best three chances of the game come in the final 10 minutes. A long throw from Sullivan bounced through the area to the far stick but Walpole’s Conor McDonough saw his golden chance sail over the bar. The Rebels had a free kick from 25 yards out in the 75th minute, but Carroll was quick to react and made the comfortable save to his left. Four minutes later, Walpole had the equalizer. After a scoreless first overtime period, the teams switched sides and OA cashed in on its first corner of the frame. Sheldon’s low cross was touched by Galbato right at the penalty spot, sending the ball to the back post for Gillespie to bury for the winner. “The ball deflected off a teammates leg and it was open in front of me and I just ran in there and put it away before they could get to the ball,” Gillespie said. 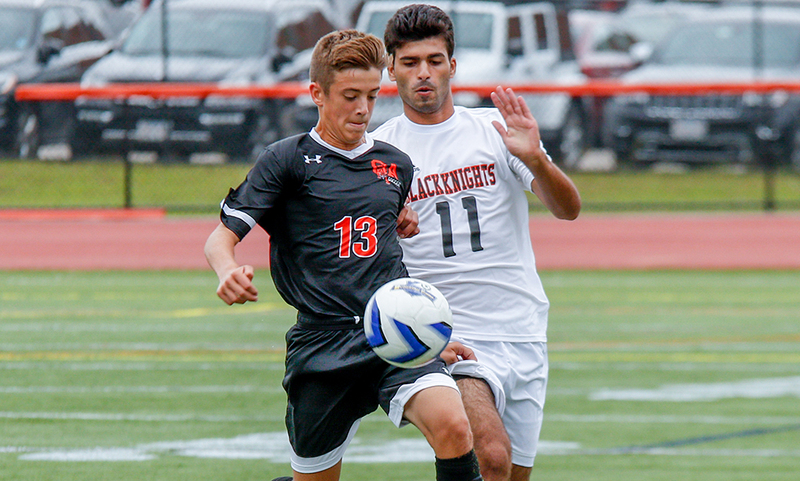 With the win, Oliver Ames boys soccer (13-2-4) to the D2 South Semifinal to take on top-seeded Nauset (18-1-1). It’s a matchup of the past two D2 State Champions. It will be the first time we play them ever in program history. They’re the number one team in the state, number three team in the region and number five team in the country so we’ll have our hands full. But we’re looking forward to the challenge. We go in as the underdogs so hopefully, we’ll go in fighting. The game between OA and Nauset is scheduled for Saturday at 2:00 at Milford High School.